I've always been enamoured by the idea of a CSA type veggie box. Enamoured because of the whole feel-good green vibe (I'm a closet greenie, okay) and also a little petrified, because, when it comes to food, I'm a bit of a control freak. In most other parts of my life I'm so laidback that I'm pretty much horizontal, but when it comes to what we're eating and specifically what I'm making, I like to plan out my meals and this of course requires full control of the grocery buying (and choosing) process. Enter Nicola and her tweet regarding local veggieboxes earlier this month. Well, curiosity killed the cat (so to speak) and I immediately signed up. I paid no heed to the voices in my head screaming: "But what if you don't like the contents? ", "How are you going to fit all the veggies into proper meals before they go off?" and "Nooooooooooooooooooo, we demand control!" Yeah, those voices can get pretty pesky at times. Imagine my delight when I received my first veggiebox, brimming with freshly picked goodness - rainbow(!) swiss chard, orange-fleshed(!) sweet potatoes and a bunch of beetroots, leaves attached(! ), amongst other things. Not to mention the slender, crisp first asparagus of the season. Beetroot is one of those underrated vegetables - just because they take long to cook and stain everything in sight, people seem reluctant to want to cook them. Which is a shame really as their brilliant ruby colouring brightens up any dish and their earthy sweetness will please even the most picky palates. I decided to forego the usual slow roasting this time. Make no mistake, the beetroot bulbs shine when given this treatment, but it's a bit 'been there, done that', isn't it? Instead, I sliced them up thinly, gave them a quick turn on the stove, then layered them with slivers of leek and chunks of blue cheese atop a homemade pizza base. And let me tell you, it was goooooooooooood. The bite of the blue cheese perfectly complements the subtle sweetness of the beetroot making this unexpected combo a surefire winner. Bonus? The pretty pink beetroot slices makes for a very handsome pizza indeed. Go on, try this one for yourself, you won't be sorry. I'm submitting this to Simona from Briciole who will be hosting WHB #253. Weekend Herb Blogging is a weekly blog event spotlighting fruit, vegetables and herbs organised by Haalo from Cook Almost Anything. 3. Layer beet slices on top of the pizza base, followed by leeks and finish off by crumbling blue cheese over. Season with salt and pepper and place in the oven for 12 - 15 minutes. *I used Fairview's Blue Tower, but any creamy blue will do nicely. Make this pizza your own, by swapping the blue cheese with your favourite cheese - camembert, brie or goats cheese would all work splendidly. Heck, even feta would go down a treat. You make the best-looking pizzas! I sometimes think I'm way too much of a control freak for a CSA but then I see posts like this and I WANT NOW. Looks amazing. As usual. Beetroot, leeks and blue cheese, not a combination one will find very often. I love trying out new and different things. This looks delicious and it appears to be fairly simple to make. Thanks. The thing I love about the CSA thing is that a) you get to eat fruit & veggies in season (which we all know tastes much better) and b) it forces me to get creative with my menu planning. Been getting veggieboxes for roughly 3 weeks now and I definitely don't regret it. If you love new & different things - you're definitely going to like the taste of this pizza. Enjoy it! I did not take much too convince me that this will de belicious...I am a beetroot freak!!! Very rustic and certainly very innovative!!! 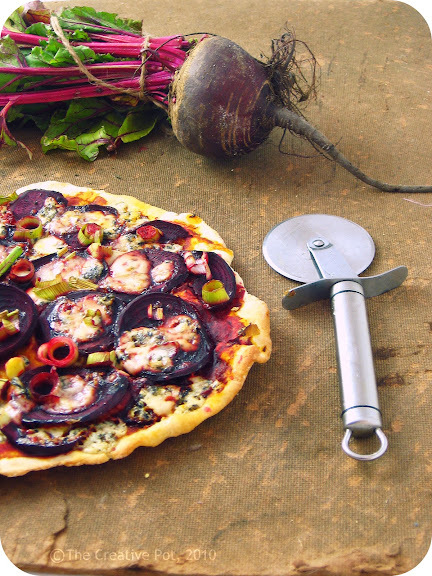 I love vegetarian pizzas, and beetroot is a favourite of mine. This will be on my next pizza for sure. The sweetness of the beetroot and the tangy richness of the cheese. Hmmm, together that is going to be awesome! Definitely need to give this one a try some time! Your cheese complemented this one perfectly! Ha, I was just in the 'been there, done that' regime for roasting beets. I think the blue cheese will lent a balance to the earthy sweetness of beets. I think this is the prettiest pizza I've ever seen! Beets and blue cheese are a really lovely combo! oh yum!!!! just love this! Yum yum yum...I looooove beets. Can't get enough really, especially when they are done in this fashion. I never would ave thought to eat them on a pizza though! Wonderful idea! This pizza looks sooo tasty and very rustic. I can almost taste the bleu cheese with beets. This sounds fantastic! I LOVE beets and have been trying a lot of new things with them (also CSA finds) this year. I'll have to try this pizza asap! Thanks! Yum! What a wonderful and colourful combination of flavours... beets are a favourite, will definitely try this out when we next whip up some pizzas! Yum! That looks delicious. I have never thought to put beets on pizza before. We have a CSA share too. We have been in beet mode too, but I made a beet salad with yogurt dressing and tonight we will have them with lentils. Thanks for the great idea. Beets with lentils are another of my firm favourites - enjoy 'em! This looks delicious! 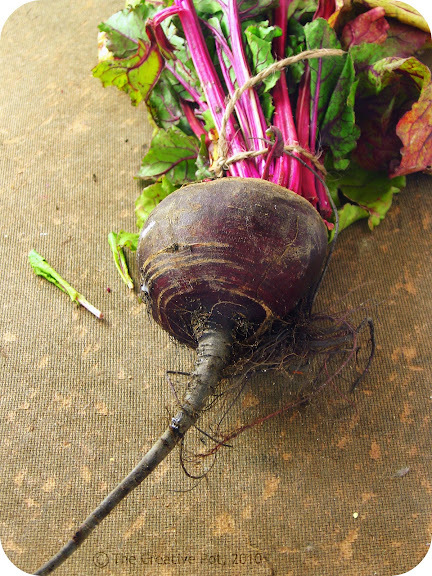 Thanks for stopping by my blog - definitely can see we share a love affair with beetroot! WOW - this pizza not only looks gorgeous but the flavors sound incredible. Love it. Great job getting creative! I would have never thought of this but it sounds terrific. I've always wanted to do the CSA thing too, but haven't been able to pull the trigger...maybe I should. oh my gosh! This looks so good I think I will make this soon. I have a garden full of beets that need to be used! I think a bit of tarragon on top would be a lovely addition. Do it Karen! It's forced me to be a lot more creative - always a good thing to shake up one's palate. Great idea! I almost never use tarragon - I think that should be remedied. This looks so gorgeous. I happen to LOVE LOVE LOVE beetroot and try to eat some at least everyday. This is such a good combination. Sweet and salty. Yumm! Dit lyk lovely. Ek is mal oor die idee van daai veggie boxes. 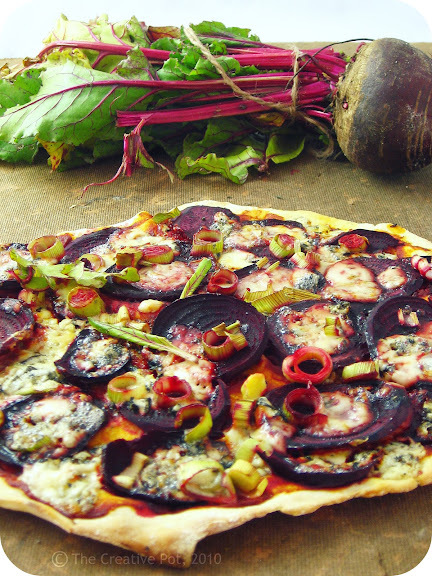 I love beetroot, blue cheese, leeks and pizza, so I will certainly try this recipe soon. I like the colorful result and noted that you also put a few tiny beet greens on top: very nice. I like both the root and the greens, which are quite versatile. Thank you so much for participating and good luck with your veggie box! Looks fabulous~! I'm posting this onto a friend immediately and coming back to check it out when I'm in the pizza mood again... Thanks Marisa! Ha this is funny because my CSA is exactly why I'm looking for beet recipes. Love this one.